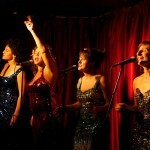 The Glamma Rays are: Jodi Phillis, Genevieve Davis, Malika Elizabeth & Tiffany Sinton. Jodi is a singer/songwriter, composer and arranger who cut her teeth as the front woman for the 90&apos;s alternative pop/rock group The Clouds. The Glamma Rays&apos; sound is evocative of times gone by, yet truly original with Jodi&apos;s great songwriting and magical arrangements. Each woman brings her own individual vocal style, talent and personality to the group. Having heritage from all around the globe, as well as being mothers and great friends, The Glamma Rays glow with a loving energy that is hard to resist.